This Has To Be The World’s Largest School Of Cobia! This Is What 1,000+ Redfish Look Like On Underwater Film! Wait Until You See The Massive Snook That Crushes This Guy’s Topwater Plug! This Is What Every Lobster Diver Dreams Of Seeing In The Florida Keys! These Protestors Want To Abolish Fishing. Find Out Why. Have You Seen This Trailer For The New Season Of Seahunter? This Is How You Clean A Redfish In 20 Seconds Or Less! Watch The “Next Crocodile Hunter” Get Stabbed By Deadly Fish And Then Land A Bull Shark! You’ve Got To See What This Redfish Attempted To Swallow! Underwater Footage Of The World-Record Mangrove Snapper Honey Hole! Craziest Black Drum Footage Yet! These Guys Even Jump In The Middle Of The School! Check Out The Hungry School Of Redfish These Lucky Guys Run Into! You’ve Got To See This Wild Drone Footage Of Tiger Sharks Cleaning Up A Dead Whale! Free Contest Giveaway! Roundabout Boat! Enter Now! 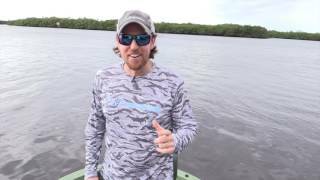 How NOT To Catch & Release Your First Redfish! Can You Guess How Many Spots This Rare Leopard Redfish Has? Find Out Now. This Is What Spearfishing “Down Under” Looks Like. Awesome Compilation! The Truth About Algae Blooms And Water Mismanagement In Florida.